Below are examples of View-Masters made since 2000 by Mattel's Fisher-Price brand . The optical quality of the some of the early Fisher-Price Virtual-Viewers was very poor, with a great deal of distortion of the lens, however, later models had quite reasonable optics and gave a good quality enlarged image, similar to the Model D. If you are considering purchasing one and it is possible, try viewing a reel through it first to ensure you have one with good optics. The blue horizontal viewer , show in the top picture, uses a new method for illuminating reels, taking ambient light from above and then reflecting it on small mirrors. This gives a good, bright image. This viewer has 18 stereo images. 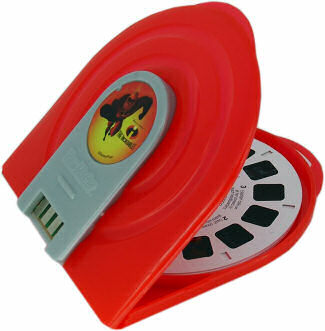 It was produced by Fisher-Price under the View-Master brand name. It takes special viewing cards, each one of which contains a single stereo pair. There are sixty different cards , known as 'Windows' in the complete set. The reverse side of the Windows form a mural when all laid out together. 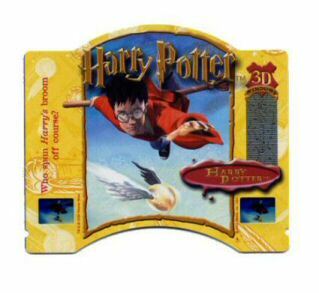 A point of interest is that these Harry Potter items are sold using the USA name "Harry Potter and the Sorcerer's Stone", rather than Harry Potter and the Philosopher's Stone, as the story is known in the United Kingdom. 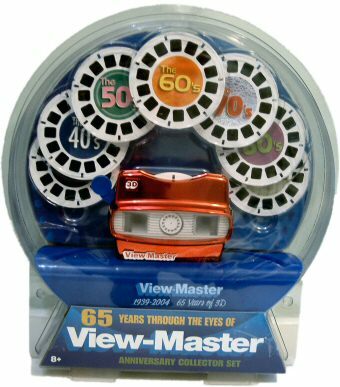 The viewer below comes from the View-Master 65th Anniversary Collection Set issues in 2004. It comes complete with eight reels which have original pictures taken from reels of the relevant period. Chip based technology finally reaches the View-Master viewer. This 2005 viewer is based around the same format as the Model O, or Horizontal viewer as pictured at the top of this page. This viewer has a slot in the back to receive a cartridge which doubles as a reel storage case. When a reel is inserted and advanced, the sound effect or dialogue associated with the picture being shown is played automatically. The sound comes through a round speaker grill, visible on the left of the left-hand picture below. The orange button allows the sound to be replayed and there is a switch with three settings, off, low volume, high volume. The reel case also contains a chip in which the sound effects are stored.